VANCOUVER — Student thespians from Skyview High School swept the awards during the 2019 One-Act Play Festival hosted by Stageworks Northwest Theatre. The drama club won four times, for Best Play, Best Performer, Best Supporting Performer, and Best Student Director. The club was then able to perform for two nights at the Stageworks theater in Longview. 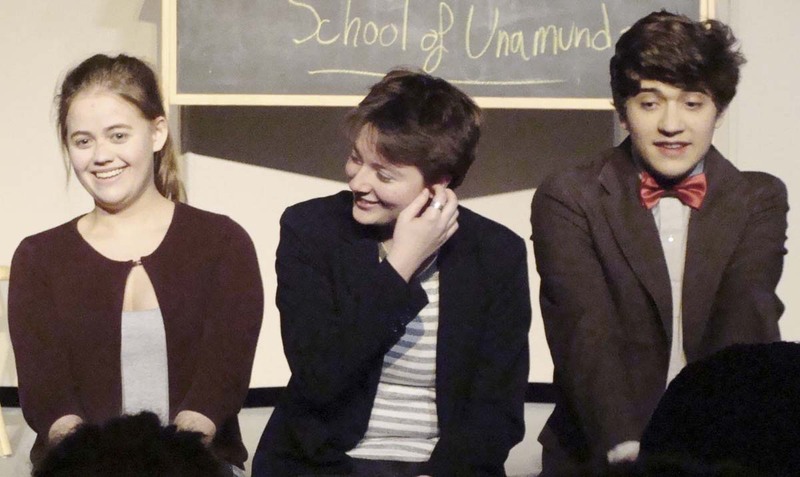 Skyview drama earned awards for their production of “The Universal Language” by David Ives. The play centers on two people learning a made-up language. The first character comes to a “school” to learn Unamunda, (the strange new language with pieces from english, german and other romance languages), from the teacher. The teacher is actually scamming his pupils though, by selling them lessons on the fraudulent made-up language. In spite of this, the characters actually learn to love the humorous language and even appear to fall in love, but not before welcoming the next student. Skyview drama club performed the play last year, with students Sam Sparkman and Josephine Young starring and Megan Bilyeu directing. For more information on upcoming Skyview drama club performances, or on the group itself, visit the Skyview High School news page, or Skyview Drama Club on Facebook.